According to the U.S. Bureau of Labor Statistics, transportation and logistics operations is the second largest employment sector in the United States. The fluidity of integration in the field of transportation and logistics has expanded to include air, rail, sea, and truck transport. As multinational corporations, governmental, and non-governmental organizations (NGOs) have expanded supply chain networks into an international industry, transportation and logistics is essential to the economic stability of this country. With an annual Gross Domestic Product (GDP) contribution hovering close to 9 percent, and is expected to increase, this trillion-dollar industry is looking to hire those who have the knowledge and skills necessary to increase efficiency and output of product. At MDC, students will focus on supply chain logistics and management. They will learn to engineer solutions to operational problems while developing the analytical skills needed to excel in this fast-paced environment. Students can choose to work domestically or internationally for governmental agencies, global carriers, private or private and public sector organizations. And, with the School of Aviation’s proximity to the Port of Miami and Miami International Airport, students will gain the experience needed to coordinate and manage the movement of goods both domestically and internationally. Transportation and logistics planning involves determining and assessing modes of distribution for materials and products. Essential traits involve data analysis and calculation as well as communication and customer service skills. Duties may include coordinating schedules, verifying carrier rates, managing inventory, tracking shipments, and ensuring product safety and security. In turn, logisticians manage the entire life cycle of a product, from its acquisition to its delivery. The flow of information is essential in transportation and logistics. Students must be able to coordinate the movement of goods and supplies via proper channels of articulation and agreement. This coordinated effort involves understanding the financial parameters associated with transport and the processes for obtaining approval and validation. Those involved in the marketing and finance aspect of transportation and logistics must account for a full range of strategic development and planning from building partnerships to securing buyers. Two of the core aspects of supply chain management are distribution and allocation. As a vital and complex movement, the movement of goods must be secured to ensure the welfare of the personnel handling the product, the product itself, and the security of the organization. Stakeholders and coordinators must be proactive in their planning and execution of operations. Threats to product viability include but are not limited to potential counterfeit, threats to integrity, cybersecurity breaches, and weather phenomenon. Modalities of transport are no longer confined to domestic shores. With the advancement of technology, transportation and logistics is a global enterprise. Despite this growth, the fundamentals of trade still dominate the world economy: supply and demand. For international trade, however, coordinators must keep abreast of changing laws and regulations, exchange rates, labor demands, and technological changes to increase efficiency and improve output. Aviation is a field that starts from the ground up. Before take-off, planes must be prepped, inspected, and guided to the runway. Carrying approximately two million passengers per day− or almost one billion people per year− aircraft are regulated by the Federal Aviation Administration to ensure the safety of its people and cargo. At MDC’s School of Aviation, our accredited degree and certificate programs will prepare students for a career in the field of aviation. As an FAA-regulated Certified Training Program (CTP), under Part 141, we will be authorized to certify graduates of our program with a restricted privilege ATP certificate. The standard FAA requisite is at least 1,500 hours, but with an Associate in Science degree from our School of Aviation, that number is reduced to 1,250 hours of flight training(pending approval). 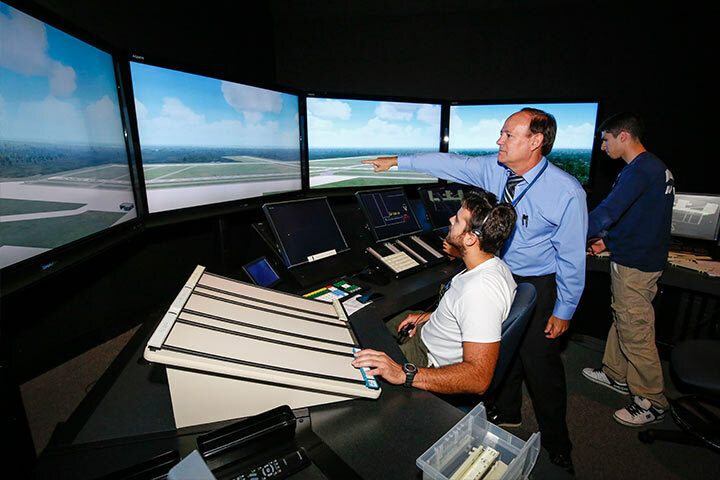 Students also have the option to add an air traffic control (ATC) specialization. This degree includes an option to specialize in Air Traffic Control. The ATC specialization is designed to better prepare students for the FAA-qualifying examinations in Oklahoma City, Oklahoma; it does not guarantee or lead to immediate employment as an air traffic controller. Students must apply through the FAA hiring portal to be considered for OKC, but they should first check with the FAA to see if they meet basic eligibility requirements.